Home cooking has never been easier than when you have a Bosch oven in your kitchen. Bosch ovens heat up quickly and will warm your food evenly every time you use it. When you enjoy cooking for your family or inviting guests over for a dinner party, you need an oven you can rely on and because each Bosch oven is engineered to the highest standards, you’ll never have to worry. You can rustle up a pizza or fish fingers, or go for something more complicated like a roast dinner. No matter what’s on the menu, your Bosch oven won’t let you down. Bosch ovens come in a range of styles and finishes including elegant black, stunning brushed steel and professional stainless steel that will give your kitchen a touch of wow factor. Bosch ovens use technology to ensure they use less energy to heat your food, which means they’re better for the environment. When you’re looking for a luxury oven that will look amazing in your kitchen, take a look at our complete collection of Smeg ovens. 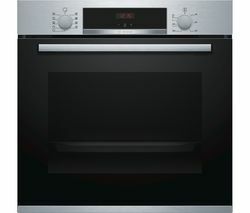 And if you can’t find something you like, check out our range of reliable and affordable Hotpoint ovens. 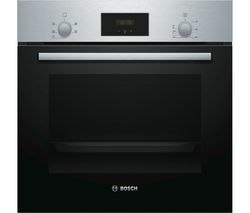 If you want to get creative in the kitchen at meal times, a Bosch oven is ideal.